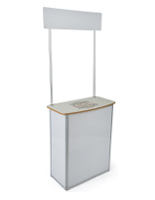 This demonstration counter, also called an exhibit booth, comes with a carrying bag. The promotional booth can easily fit inside of this large transportation bag once collapsed. Exhibitors can quickly assemble and disassemble this demonstration booth that collapses in less than 5 minutes. 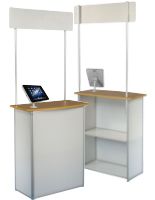 This portable exhibit booth requires no tools for set up! The demonstration counter is constructed from plastic and aluminum. The tradeshow promotional booth has (2) plastic shelves on the interior of the display. Extra brochures, pamphlets, flyers and business cards can be stored on the shelves out of sight so your exhibit always appears clean and organized. The demonstration counter has a header for displaying company logos, graphics and more. The header of the tradeshow booth sits 69-3/4"h off the ground and is 30-1/4"w x 11"h. Exhibitors must have the header customized at a local print shop. 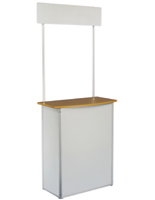 The demonstration counter is tall enough to get potential customers from afar to come and see what promotion is being held at the booth. When assembled, the demonstration counter is lightweight enough to be moved with ease by one person. The tradeshow booth can be used in one location in the morning, dissembled and put back together and be used in another location without breaking a sweat. 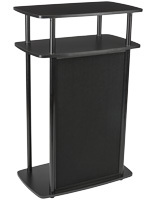 The demonstration counter comes in a sleek black design, allowing the display to stand out against any background. The tradeshow booth has a generous amount of countertop space for several promotional items to be displayed. This demonstration counter is sturdy enough to hold several items on each shelf and countertop as well. 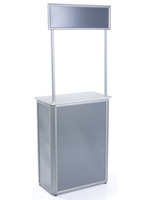 The portable tradeshow exhibit booth weighs just 14 lbs. The demonstration counter is relatively inexpensive when compared to other similar exhibits. 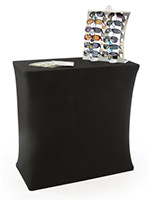 The promotional booth with a header is great for giving one-on-one advice to customers about products at a tradeshow. Each countertop that comes with a header is excellent for tradeshows, exhibits, and promotional events at stores or business presentations. 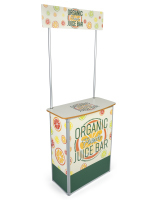 This display is an easy way to get word out about a new and exciting business or product The booth is cheap, portable, easy to assemble and lightweight. 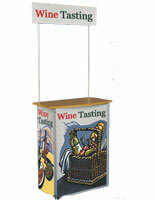 All of these features make this the perfect choice for any business to use at the next tradeshow! The Promontblk has turned out to be an awesome display unit for our customers. Easy set up and sturdy material. Great product. Thanks for the feedback, Carmoneta! We are a distillery and wanted to use this display as a way of service samples of cocktails to customers at events! This is made of all plastic that is very flimsy. It wont hold the weight that we need it to. We placed a couple boxes on top of it and the plastic legs that are holding the top up are buckling. Hi Denai, We are sorry that the counter was not sturdy enough for you. If you have any other issues or questions please feel free to contact the customer care center directly.